The private residence at Palaio Psychiko by the architectural office “Katerina Karagianni Architects” is structured on 3 levels of a total 630sq.m. Its architecture blends between its urban character and the aesthetic approach of a luxurious villa, offering different experiences to its owners. The exterior space is designed in such a way as to offer small daily escapes from the city life. 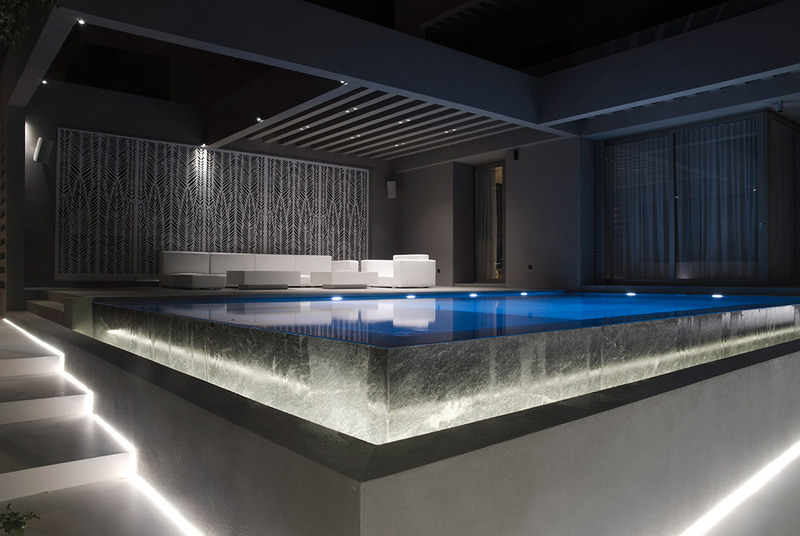 The pool of 53 sq.m., occupies the front part of the house and is lined with Aliveri marble. The outdoor space is covered by a 58sq.m. pergola, which offers shading, while metallic perforated sheets form a protective curtain from the neighboring houses. The interior space also follows a minimal grayscale concept. White is dominating, as well as the use of ceramic gray tiles, which is the investment material on the roof, the walls and the solid furniture. The huge surface of the fireplace is highlighted by using pietra gray marble in 4 large solid pieces. The stairway is a very important part of the home, as it undertakes the transport of materials to the upper level and the aesthetic connection between the two floors. The kitchen occupies a very large part of the floor plan as it includes the everyday living area. It is separated from the other functions by the use of marble benches, but is still connected visually and aesthetically. In the master bedroom and in the children’s rooms, almost all furniture has been designed to create a single harmonious ensemble. The widespread use of oak, on the floor and as an investment in furniture, gives the space the warmth that these private spaces need. The bed is designed as a wooden cocoon, while the use of wood extends into the main bath and reproduces the same philosophy. Two separate walk-in-closets have been designed, which, with the use of mirror, disappear into the room. Children’s rooms are carefully designed to meet the needs of teenagers. The floor also becomes walling material to give a warm touch to the perimeter boundaries. The house is designed with simple and minimal lines. What is unique and impressive is the fact that materials actually signify the change of uses, which are distinct without a natural obstacle. The perception of a single space that occupies the entire length and breadth of the dwelling is clear, but at the same time, there is no overlapping of the different functions.